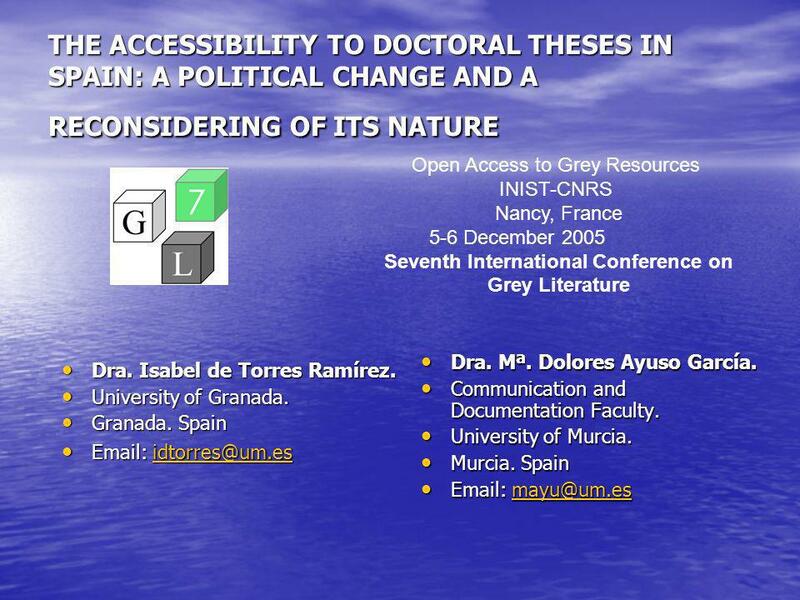 Online Form THE ACCESSIBILITY TO DOCTORAL THESES IN SPAIN: A POLITICAL CHANGE AND A RECONSIDERING OF ITS NATURE. 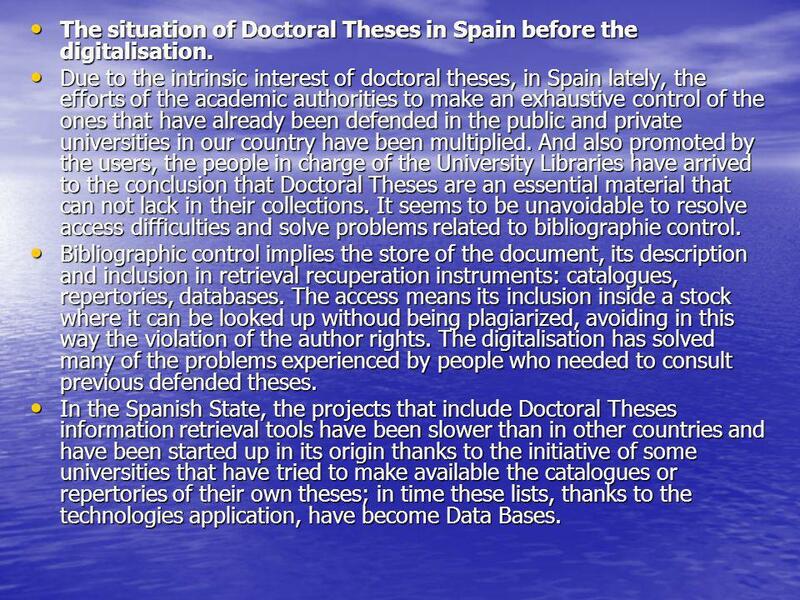 2 The situation of Doctoral Theses in Spain before the digitalisation. Due to the intrinsic interest of doctoral theses, in Spain lately, the efforts of the academic authorities to make an exhaustive control of the ones that have already been defended in the public and private universities in our country have been multiplied. And also promoted by the users, the people in charge of the University Libraries have arrived to the conclusion that Doctoral Theses are an essential material that can not lack in their collections. It seems to be unavoidable to resolve access difficulties and solve problems related to bibliographie control. Bibliographic control implies the store of the document, its description and inclusion in retrieval recuperation instruments: catalogues, repertories, databases. The access means its inclusion inside a stock where it can be looked up withoud being plagiarized, avoiding in this way the violation of the author rights. The digitalisation has solved many of the problems experienced by people who needed to consult previous defended theses. In the Spanish State, the projects that include Doctoral Theses information retrieval tools have been slower than in other countries and have been started up in its origin thanks to the initiative of some universities that have tried to make available the catalogues or repertories of their own theses; in time these lists, thanks to the technologies application, have become Data Bases. 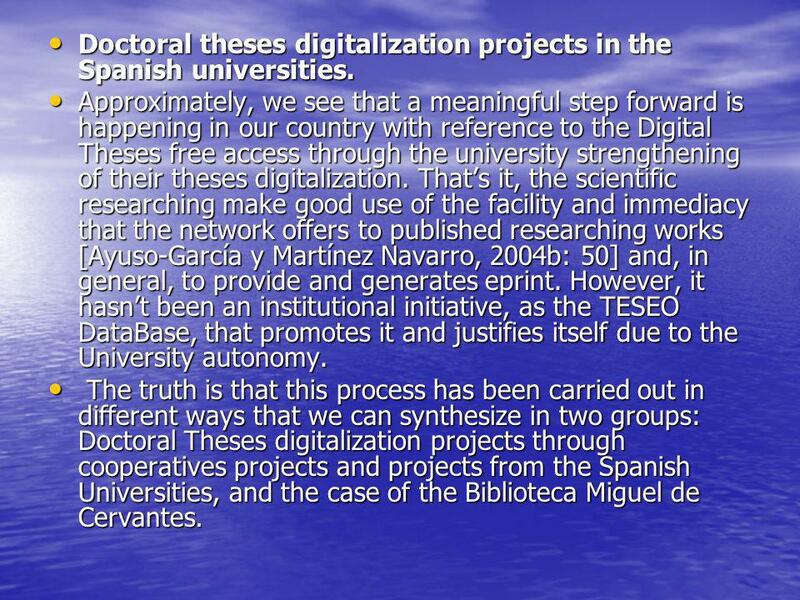 4 Doctoral theses digitalization projects in the Spanish universities. Approximately, we see that a meaningful step forward is happening in our country with reference to the Digital Theses free access through the university strengthening of their theses digitalization. That’s it, the scientific researching make good use of the facility and immediacy that the network offers to published researching works [Ayuso-García y Martínez Navarro, 2004b: 50] and, in general, to provide and generates eprint. 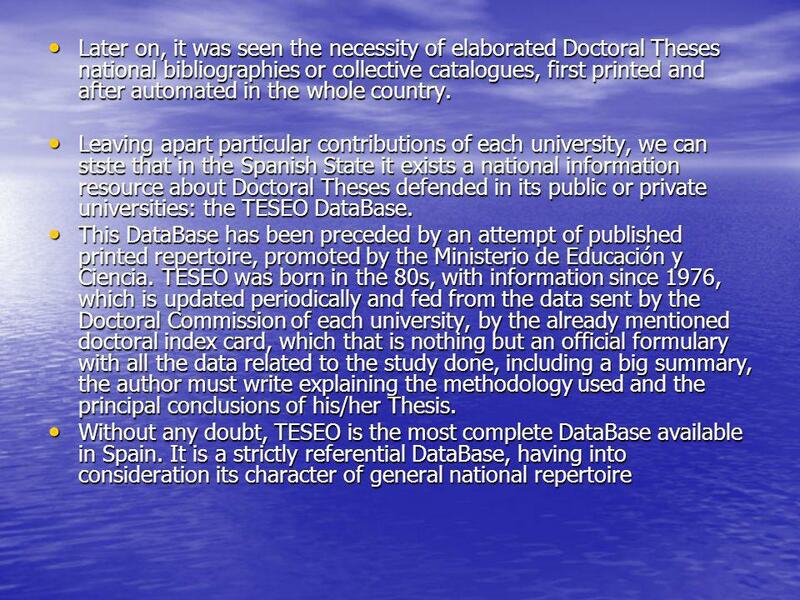 However, it hasn’t been an institutional initiative, as the TESEO DataBase, that promotes it and justifies itself due to the University autonomy. The truth is that this process has been carried out in different ways that we can synthesize in two groups: Doctoral Theses digitalization projects through cooperatives projects and projects from the Spanish Universities, and the case of the Biblioteca Miguel de Cervantes. 5 Cooperative Projects. The most important cooperative projects that have taken place are: a) The server “Tesis Doctorales en Red” (TDR). 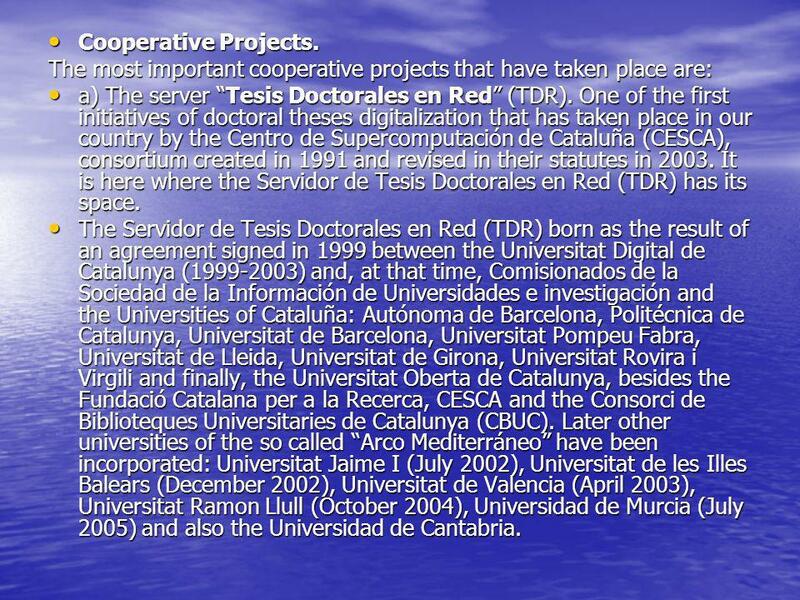 One of the first initiatives of doctoral theses digitalization that has taken place in our country by the Centro de Supercomputación de Cataluña (CESCA), consortium created in 1991 and revised in their statutes in It is here where the Servidor de Tesis Doctorales en Red (TDR) has its space. The Servidor de Tesis Doctorales en Red (TDR) born as the result of an agreement signed in 1999 between the Universitat Digital de Catalunya ( ) and, at that time, Comisionados de la Sociedad de la Información de Universidades e investigación and the Universities of Cataluña: Autónoma de Barcelona, Politécnica de Catalunya, Universitat de Barcelona, Universitat Pompeu Fabra, Universitat de Lleida, Universitat de Girona, Universitat Rovira i Virgili and finally, the Universitat Oberta de Catalunya, besides the Fundació Catalana per a la Recerca, CESCA and the Consorci de Biblioteques Universitaries de Catalunya (CBUC). Later other universities of the so called “Arco Mediterráneo” have been incorporated: Universitat Jaime I (July 2002), Universitat de les Illes Balears (December 2002), Universitat de Valencia (April 2003), Universitat Ramon Llull (October 2004), Universidad de Murcia (July 2005) and also the Universidad de Cantabria. 6 FIGURE 1 Information quantity, in gigabytes, transferred by Universities The added value also allows knowing thepercentage of the stock consultation for country/domain and Universities. 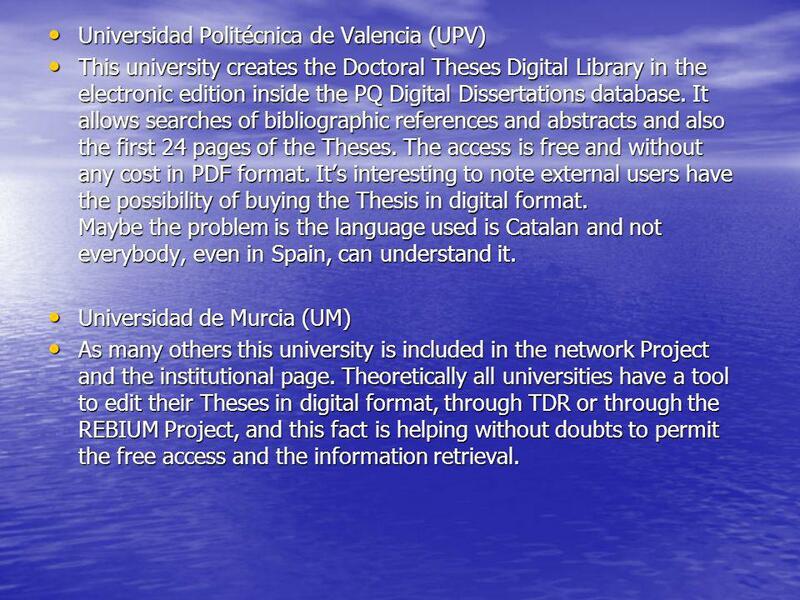 7 The Digital Theses in the Spanish Universities. This Project is coordinated by the Red de Bibliotecas Universitarias (REBIUM) that collaborates with the Conferencia de Rectores de las Universidades Españolas (CRUE). It’s an ambitious project, which compiles all Doctoral Theses initiatives in Spain with a complete text. This project, as the one we have seen before, and collaborating with TDR verifies that the Spanish universities, on the whole –as well as the particular actions that we will see afterwards- go for the creation of systems to diffuse in OAI their Doctoral Theses and other academicals and scientific documents, which contribute to spread this typology of GL. 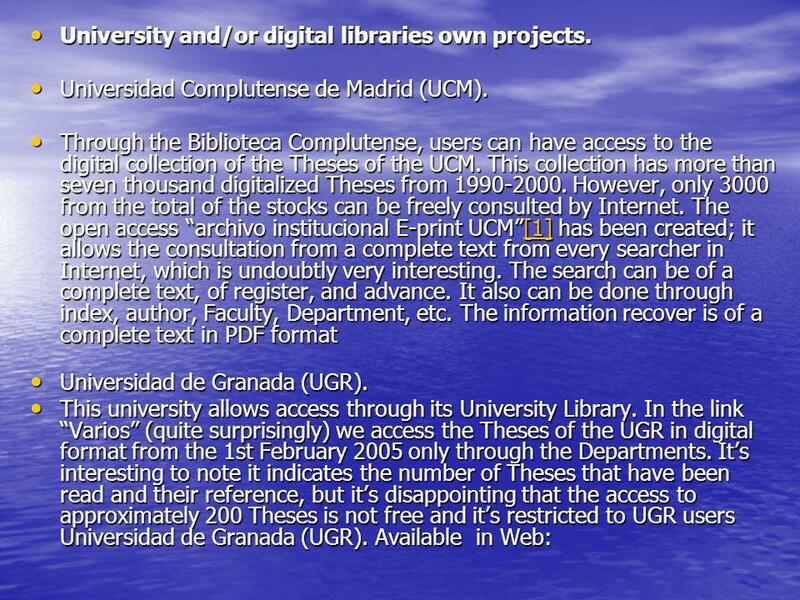 In this way, it motivates the creation of their own open archives or it recommends to use the TDR server to deposit them and even the e-prints server of the Universidad Complutense (now in testing phase). To retrieve the information it’s used the online Doctoral Theses Cybertheses researcher, as well as to supply information about the TESEO Data base and the Electronic Theses and Dissertations Cybertheses/ Cyberdocs Digital Library. Regarding the online Doctoral Theses international projects, those systems wich help to spread the Theses and other academicals works information in OAI are chosen, knowing the access difficulty even with the efforts that are being made to solve it, but above all aware of the importance of these documents to the economic, researching and also social and industrial activity. 9 University and/or digital libraries own projects. This university creates the Doctoral Theses Digital Library in the electronic edition inside the PQ Digital Dissertations database. 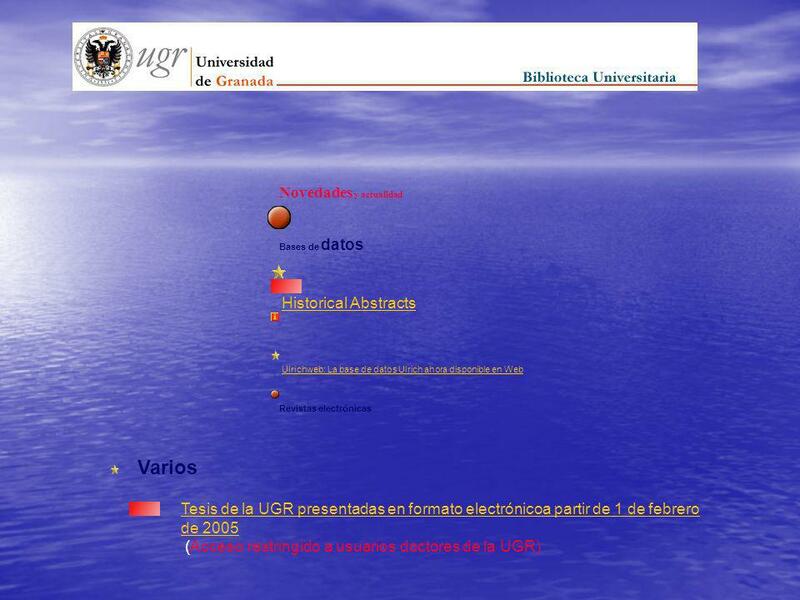 It allows searches of bibliographic references and abstracts and also the first 24 pages of the Theses. The access is free and without any cost in PDF format. It’s interesting to note external users have the possibility of buying the Thesis in digital format. Maybe the problem is the language used is Catalan and not everybody, even in Spain, can understand it. Universidad de Murcia (UM) As many others this university is included in the network Project and the institutional page. 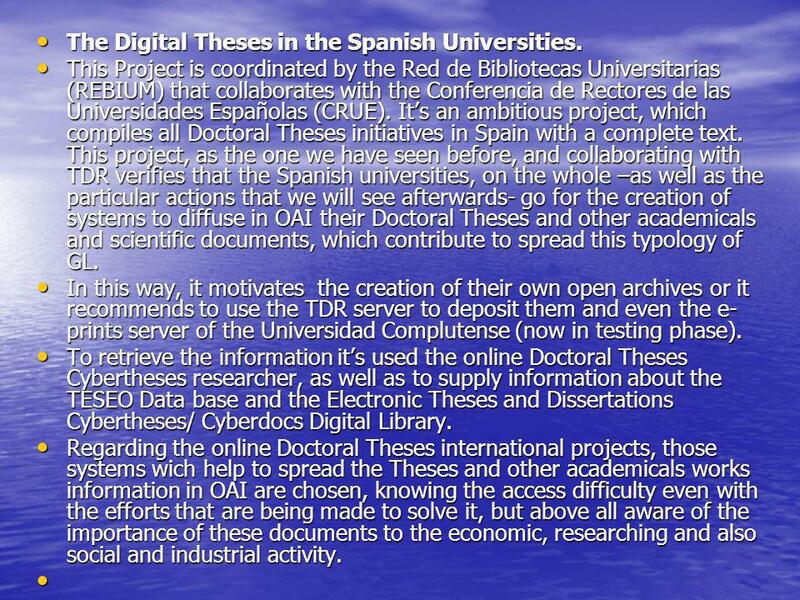 Theoretically all universities have a tool to edit their Theses in digital format, through TDR or through the REBIUM Project, and this fact is helping without doubts to permit the free access and the information retrieval. 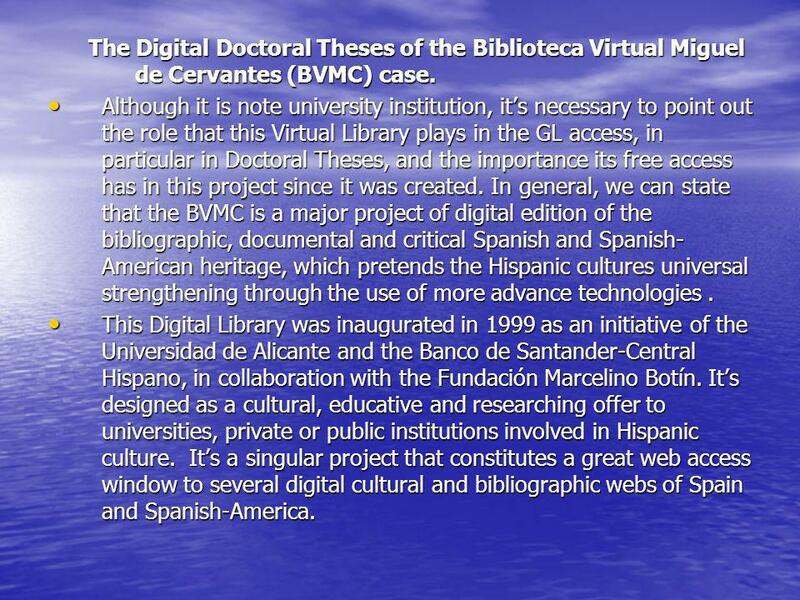 12 The Digital Doctoral Theses of the Biblioteca Virtual Miguel de Cervantes (BVMC) case. Although it is note university institution, it’s necessary to point out the role that this Virtual Library plays in the GL access, in particular in Doctoral Theses, and the importance its free access has in this project since it was created. In general, we can state that the BVMC is a major project of digital edition of the bibliographic, documental and critical Spanish and Spanish-American heritage, which pretends the Hispanic cultures universal strengthening through the use of more advance technologies . 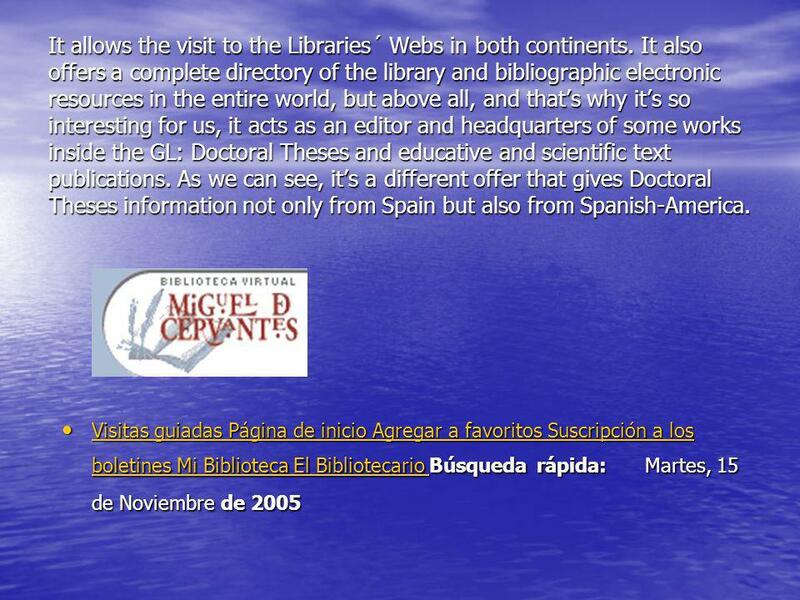 This Digital Library was inaugurated in 1999 as an initiative of the Universidad de Alicante and the Banco de Santander-Central Hispano, in collaboration with the Fundación Marcelino Botín. It’s designed as a cultural, educative and researching offer to universities, private or public institutions involved in Hispanic culture. It’s a singular project that constitutes a great web access window to several digital cultural and bibliographic webs of Spain and Spanish-America. 14 CONCLUSIONS. Summing up we would like to go back to the concept we have already explained at the beginning of this work by saying that this part of the GL, Doctoral Theses, is not really widespread and often when they are very limited. That’s why the access to scholars, researchers and users in general is very difficult, even though this situation is getting a little bit better nowadays. We would like to point out that, in spite of its importance, the TESEO DataBase is not enough. 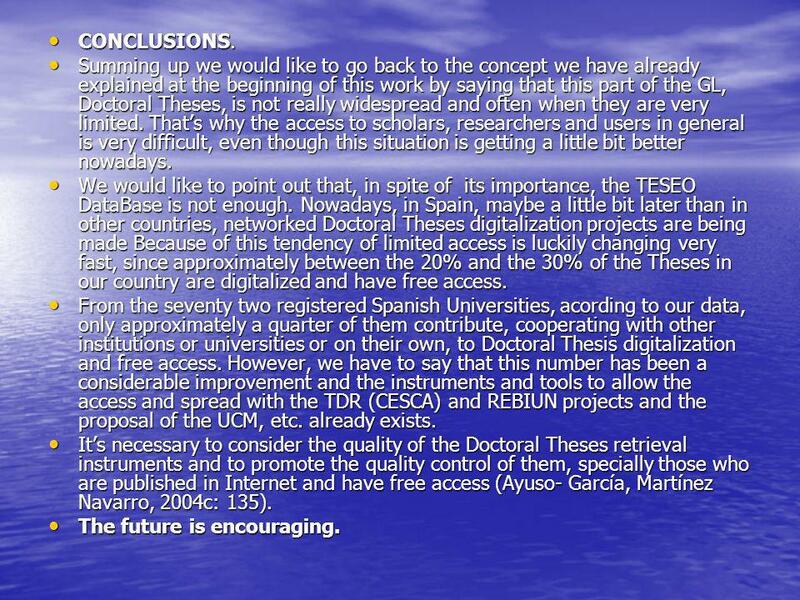 Nowadays, in Spain, maybe a little bit later than in other countries, networked Doctoral Theses digitalization projects are being made Because of this tendency of limited access is luckily changing very fast, since approximately between the 20% and the 30% of the Theses in our country are digitalized and have free access. From the seventy two registered Spanish Universities, acording to our data, only approximately a quarter of them contribute, cooperating with other institutions or universities or on their own, to Doctoral Thesis digitalization and free access. However, we have to say that this number has been a considerable improvement and the instruments and tools to allow the access and spread with the TDR (CESCA) and REBIUN projects and the proposal of the UCM, etc. already exists. It’s necessary to consider the quality of the Doctoral Theses retrieval instruments and to promote the quality control of them, specially those who are published in Internet and have free access (Ayuso- García, Martínez Navarro, 2004c: 135). The future is encouraging. Download ppt "Online Form THE ACCESSIBILITY TO DOCTORAL THESES IN SPAIN: A POLITICAL CHANGE AND A RECONSIDERING OF ITS NATURE." Ubiquity of Grey Literature in a Connected Content Context Julia Gelfand University of California, Irvine Paper presented at GL5 Conference. Grey Literature in Slovenia – Traditional is solved, what's next? File name/location Company Confidential Copyright © 2000 Eli Lilly and Company MEDES: Development of a completely new Spanish medical bibliographic database. Google Scholar and Web of Science: Similarities and Differences in Citation Analysis of Scientific Publications Maurella DELLA SETA, Rosaria CAMMARANO. Document Repositories and the copyright issue Marc Goovaerts Hasselt University Library ODIN-PI TRAINING OSTENDE, May 2008. Preservation and conservation of the digital documentation in the Catalan Government Special Libraries Mid-Term Conference in Barcelona April 22-23, 2010. 3ra Jornada sobre la Bibiotecal Digital Universitaria, Cordoba, Octubre Options for the development of electronic journal publishing in Latin America. Library Consortia in Spain Azucena Blanco Pérez. Consorcio Madroño 2 SELL Meeting. Barcelona, 2002. Open Access Spanish landscape and the case of a pilot project with authors Reme Melero, IATA, CSIC International. Highlights from the Open Access Timeline (1) 1971, Project Gutenberg launched on the Internet (originally as an FTP site). There are now 18,000 free books. ETD: doing it together Lluís M. Anglada Consortium of Academic Libraries of Catalonia (CBUC) ETD 2003 Berlin, May 22nd, 2003. EDEN 2007 Naples, Italy LIFELONG LEARNING TEACHERS’ NEEDS IN VIRTUAL LEARNING ENVIRONMENTS Josep Maria Boneu 1, Maria Galofré 2, Julià Minguillón 2 1 Centre. EPrints.FRI The institutional publications database of the Faculty of Computer and Information Science, University of Ljubljana, Slovenia Faculty of Computer. Universidad Autónoma del Estado de México Network of Scientific Journals of Latin America, the Caribbean, Spain and Portugal Redalyc The Open Archives. The AECID digital library and its possibilities to contribute to sustainable international development Araceli GARCÍA IFLA Satellite Conference. August.